MILAN, ITALY – November 7, 2018 – At EICMA 2018 KYMCO announced the launch of KYMCO SuperNEX, a fusion of “supersport” and “electric” that delivers everything modern supersport riders dream of. “While people have no doubt that the next era of personal transportation is electric,” said Allen Ko, KYMCO chairman. “Many are still pondering over the profound implications of electric in the world of supersport motorcycles.” The quiet nature of the electric motor troubles motorcycle enthusiasts for the absence of the familiar roaring sound. Without the gratification of gear shifting, the simple twist-and-go interaction feels more utility-oriented, and sometimes even toy-like. Also, most electric motorcycles today lack the sustaining thrill of acceleration to the top-end after the initial rush. As a result, many sport bike lovers fear that supersport might lose its charm in the impending new electric era. First and foremost, SuperNEX was designed around the philosophy that shifting is the art of motorbike riding. 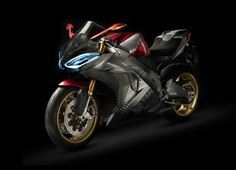 Hence, the electric supersport bike has the most advanced 6-speed transmission that allows riders to enjoy every minute of their skill-honing endeavors. It comes with clutchless upshift and downshift features. The slipper clutch further helps smooth out the ride on normal downshifting. Motorcycle riders are often looked up to by others for their skills in commanding the full potential of the vehicle. They master the timing of shifting to utilize different power bands of the motor. They are driven by the improvement of their own skills and the pursuit of self-realization. To motorcycle riders, perfect gear shifting is a statement of status, exclusivity, and pride. The gears make motorcycle riding timelessly fascinating. With the gears, SuperNEX provides the human-machine connection that all sportbike riders can’t live without. An unfortunate shortcoming of today’s electric motorcycles is that the inherent characteristic of the electric motor has a power curve that reaches maximum horsepower at midrange and then declines thereafter. As a result, on a single gear electric motorcycle, once it reaches a certain speed the surge of acceleration starts to fade noticeably. Moreover, this lack of power is most often felt at high-speed riding, which supersport riders enjoy the most. SuperNEX is a totally different story. The 6-speed transmission allows riders to make use of the most optimal power band of the motor to extract the full potential of the vehicle. The gears help improve not only the efficiency and responsiveness, but also the acceleration and top speed. As a result, SuperNEX can go from 0 to 100km/hr in 2.9 seconds, from 0 to 200km/hr in 7.5 seconds and from 0 to 250km/hr in 10.9 seconds. Such insane performance at any speed is simply irresistible. When acceleration feels like a completion of a thought, the SuperNEX experience is simply irresistible. The capabilities of today’s supersport motorcycles exceed the skills of most riders. Therefore, to allow all sport bike lovers to confidently engage in the quest of the next level of skills, KYMCO created KYMCO FEP – KYMCO Full Engagement Performance – an advanced performance management system that allows the rider to engage the full potential of the vehicle. With FEP, riders can always perform a perfect launch. During hard acceleration, FEP ensures there is no wheelie or wheel slippage. During hard braking, FEP prevents rear wheel lifting. When riding through uneven or wet surfaces, FEP provides maximum traction. Moreover, the degree of FEP engagement can be adjusted to riders’ preference. KYMCO wants to extend the privileged pursuit of the ultimate thrill of supersport to a larger group of riding enthusiasts. FEP empowers all sportbike riders to enjoy the full potential of SuperNEX. The electric motor is born to be quiet by nature. This becomes an issue on a supersport bike because without sound, the character, sensation, and passion of the machine are lost. It becomes just a means of personal transportation, not an object of fiery desire. SuperNEX, on the other hand, offers the world’s first Active Acoustic Motor, which is designed to convey the heartbeats of the machine. The motor has a multi-frequency acoustics generator that reconstructs the dynamic sounds of the motor with great authenticity. It delivers the iconic supersport thrills and messages that every sportbike rider needs. The sound can be further tuned to rider’s liking for its character and volume. On a supersport motorcycle, the sound is one of the most important media for the human-machine connection. The sound communicates the rpm level and the load condition of the motor. It constantly gives the rider situation awareness, so riders can determine their timing for shifting the gear and applying the throttle. And, with the rpm rising and the speed climbing, riders hear the surge of the sound one crescendo after another. It is one of the most intense sources of thrill for the sportbike riders. The sound also declares the unique character of the machine. Whether it is vrooming, roaring, rumbling, or screaming, every supersport bike has its own distinct sound that is different in tone, intensity, texture and delivery. It is not only a discrete projection of each machine, but also an outward declaration of the owner. The sound is the most important source of emotional engagement with a supersport motorcycle. The sound is the voice of the machine. Active Acoustic Motor gives riders the sound that speaks not only for the heart of the vehicle, but also for the soul of the rider. Sportbike riders aspire to enjoy every riding occasion to its fullest. Sometimes riders want to be wild, but often they choose to be civilized. At certain occasions it is fulfilling to go all out, but in other situations they choose to be reserved. Being in total control is the norm, but riders also like the option to live on the edge.